Just letting our readers and friends know that the South Santee website is down for just a couple of hours today while transferring to new servers. We appreciate your understanding. You can always reach your favorite aquaculture team by visiting Algaecontrol.us site. Thanks for your support. 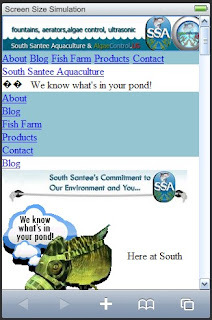 We've been working on several new updates and inprovements to the South Santee Aquaculture site, including this new RSS page where you can read all of our latest news on aquaculture, products and algae control. Visit and bookmark it today! Also, feel free to connect with us in social media on that page..we always love new friends. Remember a few weeks ago when we announced our new relationship with Sonic Solutions LLC? Well today we bring you some of our new and improved products from Sonic Solutions LLC. With state of the art ultrasonic algae control at its disposal, algae and biofilm problems are a thing of the past. With 72 frequencies and a coverage bandwidth of over 40 kilohertz, the new ultrasonic algae control operating system has unmatched specifications in the industry and is set to become the benchmark standard of performance. sucessfully used at power plants, golf courses, botanical gardens, water and wastewater treatment plants, marinas, and other personal and commercial installations. It lowers pH and TSS! Floating just below the surface, the device operates 24-hours a day providing coverage for up to 4.5 acres depending on conditions. Multiple units can be installed for larger applications. It is easy to install, requires almost no maintenance and uses less than 20 watts of power on average. control efforts. Thank you SonicSolutions!" but they succeeded far beyond my expectations!" problem all by itself, but the pond sure looks better."